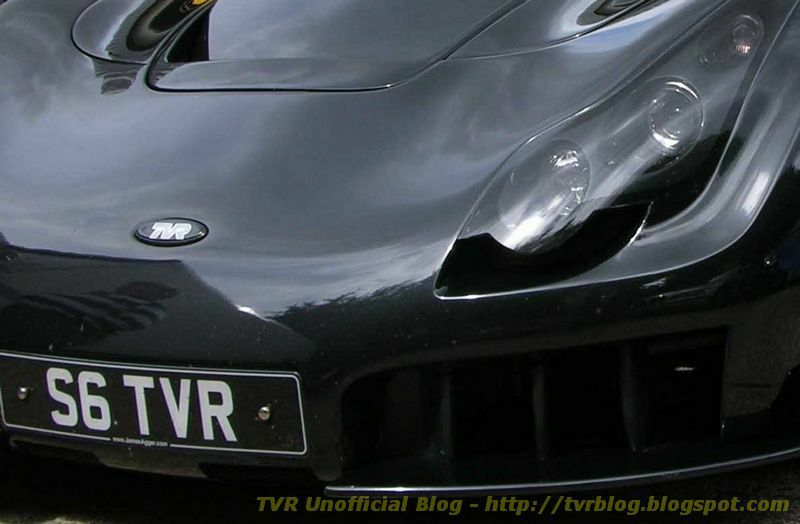 The idea of a morning at Elmwood TVR, previously TVR Fix before, one assumes, Smolenki’s lawyers decided to send out a few threatening letters, is one of the better ones for a Saturday out of the rugby season. 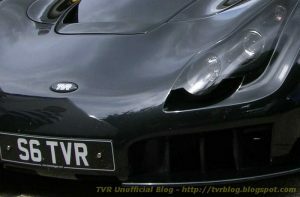 I wanted to take a few photographs for my TVR website, specifically on the outriggers that Elmwood TVR fit. 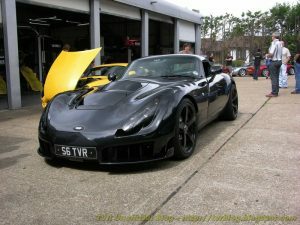 But the first thing I saw was the TVR Power Sagaris. 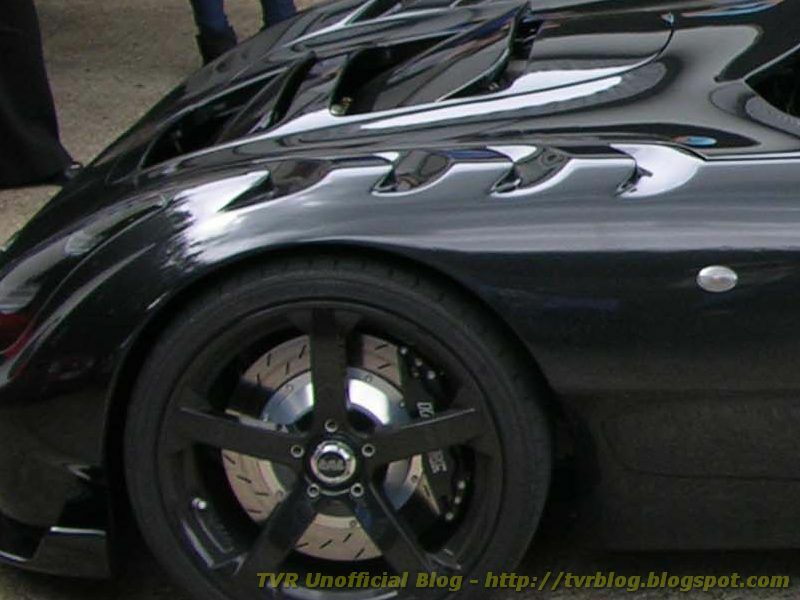 It looks stunning in black paintwork and it had, as you would expect, quite a crowd around it. The bonnet was off revealing and engine that looked, at least to my eyes, just the same as the standard 4-litre unit. Dom Tricket, the owner of TVR power, was there and I had a chat about the technical specs with him. It would appear that there has been no significant increase in bhp over the 4.3, at least as fitted to the Sagaris, but a substantial increase in drivability. I’ve always found the Speed 6 to be a delightful engine to drive behind, and this goes for whatever guise it is in. Despite the Tamora and the T350 having the smaller and lower powered versions of the Speed 6 there is no suggestion of slumming it. Both cars were faster than any other mainstream sportscar when they were in production and still are. The engine is free revving and has a delightful take-up. At higher revs you think the engine has come on cam until all of a sudden you get another boost of power. And the engine is nicely paired with the gearbox and suspension. The steering is the best I’ve ever driven. Then Dom asked if I’d like to drive the Sagaris. I’m no good with trick questions so just said yes. The inside was a bit dark. Well very dark actually, with just the occasional bit of alloy, like the very nice handbrake surround, to add a bit of glamour. The contra-rotating dials are the one thing I feel I must criticise. Some people say they like them but for me they are a styling exercise too far. 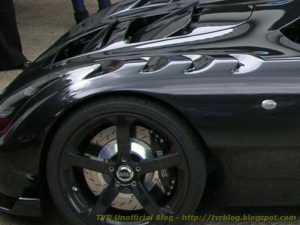 The car was as comfortable as any later TVR which is very comfortable indeed although I have to say it was not the easiest car to get into. I have a back injury which limits my flexibility but even so the friend I took with me also felt it difficult. But well worth the effort. Despite what Top Gear might say, the interior was stylish, pleasant and up-market, in the tradition of TVR. It was a nice place to be. The clutch pedal was a bit awkward at first but soon became familiar. I started the car and was a bit surprised by the lack of noise. It was very nice but not at all loud. It told this can be ‘rectified’ if you feel so inclined but after taking a T350C to Spa one time I have to say that a noisy exhaust (not to mention a noisy roof) can get a bit wearing. Dom had painted the transparent spoiler black and this limited the view through the already limited rear window but backing the car out proved no problem. The throttle has a long travel and this made driving quite easy. The clutch was also very easy to control despite the amount of power going through it. The wing mirrors were substantially mounted and provided an excellent view. Then it was out onto the road. The first thing I did was to turn off the main road onto some side roads to get a feel of the car. The surfacing was quite poor (just like anywhere else in the country) but the ride was excellent. There were no creeks or groans, no banging, nothing rubbing. There were no excuses needed either. So back onto the main drag. The degree of attention we got was quite remarkable. I drove up behind a 5-series BMW and the chap pulled over to let us pass. The car is worth buying for that alone. As we came alongside other cars the driver would wander a bit as they got a better view. Quite unnerving at times. I couldn’t give the car a real gunning as we were on public roads, but the engine was remarkable. It certainly revved quicker, not that it was a slouch before. It was very smooth. At one time I accelerated away from under 2000 revs (at least I think it was) and the car pulled strongly without hesitation. We came up to a roundabout and I saw an opportunity to get through without inconveniencing a car approaching from the right. The Sag shot forward and was across the roundabout in no time. The road surface was very uneven, going from flat to a very banked bit around the roundabout and then back onto flat again, but the car managed it without problems. On the return journey we hit traffic and were stationary for minutes at a time. The engine ticked over without problem, pulled away smoothly without hesitation and there was no need to clear the plugs by giving the throttle a bit of a blip. Unfortunately. The temperature did not even get high enough for the fans to cut in. Despite the quiet exhaust, the popping on the overrun was very noticeable. I know it is childish but I thought it great. The Sagaris was as great as every other Sagaris I’ve driven, and that is to say the best of any TVR. The engine was extremely docile without any sign of the increase in tuning. Until, that is, the throttle was pressed. It is impossible to evaluate the engine on public roads, at least in this country. Dom had just come back from a tour of the lumpy bits of Europe and the only problem was when a stone holed the rad. I need the car on extended loan to really say what it is like (any chance, Dom?) but from my all too brief drive I’ve got to say I love it. The price is, according to the website, £9000 fitted +VAT. The engine carries a 5-year guarantee. And Dom said he is considering an analogue dial package for the later TVRs with contra rotating dials. With that it would be impossible to criticise the car. Looks like a mean monster, I like it.